By Leo Frese, Independent Numismatic Consultant – LeoFreseCoins.com ………..
World War II brought an end to the U.S. Mint’s production of proof sets for collectors after 1942. When the war ended collectors were ready once again to have their numismatic appetites satisfied, but the mint wasn’t prepared. After several years of increasing demand from collectors, the mint formally reintroduced sets again in 1947. However, they were still not prepared to issue proof sets, rather, they issued what are commonly referred to today as “Double Mint Sets”. These sets were issued from 1947-1958 and were housed in cardboard cut-out holders showing each denomination produced that year from each of the mints. There was a paper covering to protect the coins and the boards. The paper was glued down to one side of the board while the other side was simply covered loosely by the paper, thus allowing easy viewing of the coins. 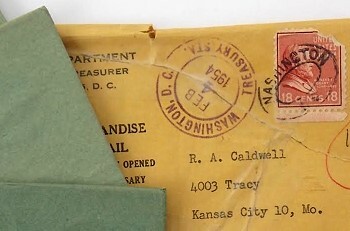 These paper-covered boards were then placed into an envelope and this envelope was placed into a secondary mailing envelope. The sets were then mailed to the happy collector. Since the paper was glued down on one side, the mint issued two of each denomination to allow both the obverse and reverse to be viewed. Thus the name “Double Mint Sets”! These fascinating sets are an interesting and collectible part of our hobby. Point of fact: Prices on Original U.S. Mint issued Double Mint sets have soared in recent months, and over the years they have increased many times in value. What has driven these prices so high, and where might prices go in the future? Although the intent of this article is to provide education and is not to promote the financial return of these sets, nor to expose their values as being too high, the reality is most collectors care about the long term financial prospects of their collections. Back to our story: The paper used to protect the coins came in various colors: beige, yellow, pink, green, and glossy green. 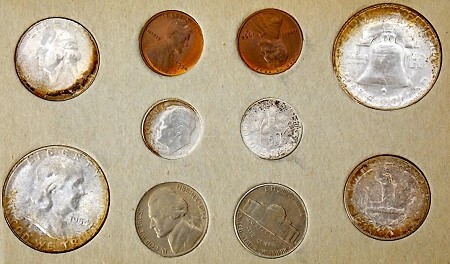 Depending on the sulfur content in the paper, the coins in the sets could develop amazing combinations of color. Simply having high sulfur was no guarantee of great color, however. Just as important was where and how the coins were stored. The degree of temperature change, humidity, and pressure over the long term storage, were every bit as important. Many sets, stored for decades along the salt water coasts, tend to be less colorful while those stored in the drier climates with large seasonal temperature changes tend to be more colorful. The scarcity of truly original sets is without a doubt one of the key factors that have driven prices. The most common set, the 1958, had an original mintage of only 50,314 sets. The scarcest set, the 1947, had an estimated number of about 5000. Over the years many sets have been lost or were broken up and the holders thrown away. It is my opinion that only about 30% of these sets have survived. You will note that no mint sets were produced in 1950. This was the year proof sets were reintroduced to collectors, and the belief at the mint was these new proof sets would fully satisfy the appetite of the collecting public. WRONG! The demand for the Double sets continued and in 1951 the mint began selling both proof and mint sets. Taking the new packaging concept of the Flat Pack proof sets introduced in 1955, the mint realized they could reduce the number of coins sold to collectors by placing the mint sets into sealed plastic beginning in 1959. This new packaging allowed both the obverse and reverse of the coins to be viewed and the coins were protected in the new holders. There was no longer a need to place two of each coin in the sets……and the potential for vibrant colors was now gone! First, there was the silver craze of 1979-1980. When the price of silver bullion caused the silver to be worth 30-35 times their face value, the melting pot was no kinder to these sets than it was to other silver coins at the time. As a result, thousands of sets were plundered for their silver and the minor coins sold or spent. Second, the first book on Franklin Half Dollars came out in the early 1980’s. The late Jack Ehrmantrout’s epic work pointed out the scarcity of many of the Franklin dates in gem condition, and even more so those with Full Bell Lines. The collector demand for FBL’s led to tens of thousands of sets being destroyed. I recently spoke with one dealer, who told me he and Jack broke up over 5000 sets in just a few months. Factor in the number of other dealers who were also breaking up sets and you have an extremely high attrition rate. Third, the implementation of a reliable and market trusted third party grading service led to many more thousands of sets being destroyed as collectors and dealers alike found that a single coin achieving the right grade by PCGS could result in a financial windfall! Finally, the last few years has seen a boom in prices paid for coins with amazing original color. This color premium has also resulted in the demise of many original sets. Well, we’ve seen some of the “good”, what can be bad? To begin with, we live in an era of greed and deceit. Don’t get me wrong, numismatics has drawn a crowd of Charletons since at least the mid 1950’s. From cleaning coins and whizzing them with wire brushes, to re-toning coins with hotplates or chemicals and using auto body putty to hide abrasions, there have been those who would take advantage of the novice and unsuspecting collector. So it is today with some of these double sets offered in today’s marketplace. Beware of sets that have had coins replaced. Sets that are not original are worth little more than prorated BU Roll bid! Looking at the chart below, you can see how costly that mistake can be! Beware of sets that have been exposed to too much moisture and have suffered environmental damage. 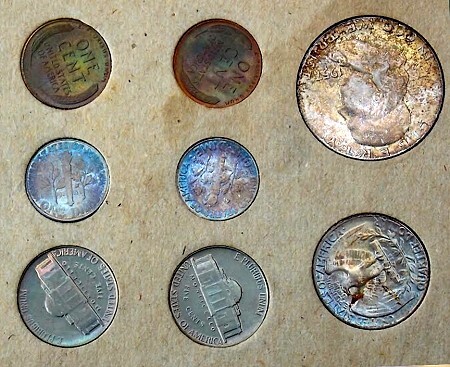 I have seen sets that were so badly “burned” from the chemical reaction with wet paper that the silver coins were worth just bullion and the cents and nickels “spendable”! Beware of sets offered at prices significantly over current bid/ask ranges UNLESS the coins in the set are monsters both in quality and/or color. I sold a 1958 set recently for $1800 at a time when bid was $300. 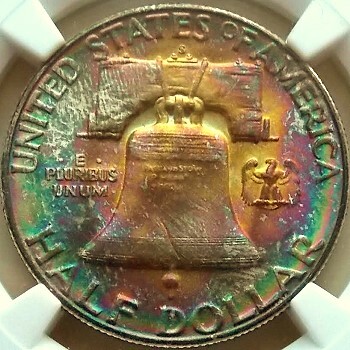 However, the halves and quarters had amazing multi-colored toning and the set was worth every penny paid! Beware of “Original Sets” housed in plastic holders, or holders other than the original mint packaging. Avoid like the plague anyone offering Original Sets from 1950. Anybody can take the old boards from common sets and fill them with BU coins to offer for sale. And, finally, be aware of “bargains”. With a number of buyers willing to pay full Bid for decent sets don’t fall for those ads where they are offering sets at 40-50% discounts. Like all collectibles, educate yourself, find reputable sources, and buy your passion! Be a collector first! For more information on these sets, or to see the complete report with 2016 Price Projections visit Leo’s website (LeoFreseCoins.com) , call (949.291.8496), or email him “Leo@LeoFreseCoins.com.